NORTH BRANFORD, Conn. (AP) -- When Greg Myerson heads out in his boat, some fishermen will follow him. The famous want to fish with him. He's the Warren Buffett of the fishing world, giving seminars in which he'll tell some but not all his secrets. 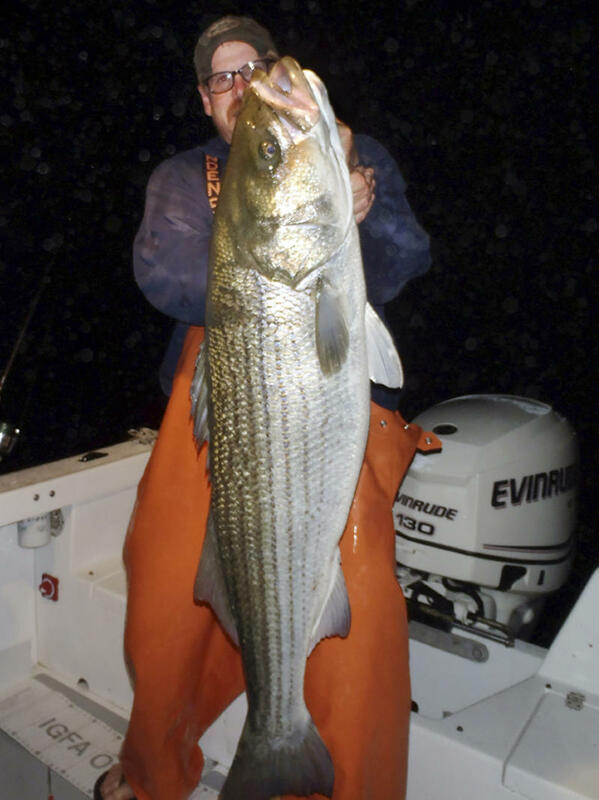 "I'm just going to go ahead and say it: Greg Myerson is the greatest living striper fisherman," declared Rick Bach in an account last month in The Fish Report. Chris Megan, owner of On the Water magazine, said he doesn't know anyone who's caught so many large striped bass. Myerson reached the pinnacle by methodically studying his prey and developing devices to lure the fish to him and, perhaps, change how people fish. "I've gotten it down to a science," Myerson said. "That's what all these great catches are attributed to, knowledge of the fish. You gotta think like them." The 45-year-old electrician from North Branford began fishing at age 2. At 8, he used the feathers from his grandmother's dead parrot to make his first fly, catching a rare rainbow trout and realizing the thrill of catching a fish with something he made. He studied fish, learning that striped bass feed on lobster and are drawn to them by the sound they make along the ocean floor. Myerson began trying to replicate that sound with a rattle he put in sinkers, at one point using discarded crack cocaine vials he cleaned up at work and filled with bearings and BBs. His methods grew more sophisticated as he listened to crayfish in his 200-gallon aquarium with a stethoscope. He also used a sound meter to determine the decibel and frequency and then tweaked the sound of the rattle to mimic it as much as possible. "It's the reason why I caught more big striped bass than anyone in the world," Myerson said. "It was my secret weapon for years." Myerson said he's received patents for his rattling sinkers designed to lure the striped bass to fishermen and formed a company called Fish Call to sell the products. "We're changing the whole fishing industry. We already have," Myerson said. Myerson stocked a stream on his property with trout and noticed how the biggest ones take the best spot. He figures striped bass do the same, such as by staying near a boulder that breaks the current so they can conserve energy as they wait for lobster to come out when tides are slow. He likes to head out in the evening and will fish through the night at times. He insists on quiet, often barefoot on the boat to prevent noise and alert to the slightest disturbance to his line. Myerson really began to attract attention when he caught three bass in 2010 that weighed more than 60 pounds and won angler of the year. In 2011, Myerson headed out in calm waters off the Connecticut coast when he snagged a powerful fish that began to pull his boat. "It was an incredible fight," Myerson said. The 81.8-pound catch, certified by the International Game Fish Association, broke a 29-year-old record of more than 78 pounds. Myerson said he's caught more than 25 striped bass that weighed at least 50 pounds, eight or nine over 60 pounds and three more than 70 pounds. Myerson has become so famous in the fishing world that others will follow him. Myerson said he didn't catch all the big fish in the same spot. "No one knows where those spots are," he said. "I'll never tell anyone where those spots are." Myerson said he has fished with actor Edward Burns, retired ballplayer Wade Boggs, top chef Tom Collichio, Miami Dolphins football player Jim Jensen and even an astronaut. Myerson is proud of his records but doesn't dwell on them. "I kind of almost crave that bite that I know is coming," Myerson said. "I don't care about any of the fish I've already caught. The best fish is the next fish for me."